This god, whose name means "Master of Fury," appears in the Viking Age literature as the highest and most powerful of the gods. Of all the gods, he is the most mysterious and the most complex. The origins of Odin's cult are very uncertain. He is first known as a god of poetry, magic, and death, which were very closely related in the Germanic mind, as the religious/magical wod ("fury/inspiration") of poetry was understood to come from the world of the dead. As the god leading the souls of the dead to the Otherworld, Odin may have then been identified as the chooser of the dead and then specifically with the selecting of the slain in battle. Above all, Odin or Wodan is a god of wisdom. His wisdom is not, however, that of peaceful serenity, but that of continuous, restless activity; his is the furious might of the storm wind, which is never stilled. The tales of Odin or Wodan show him on his endless search for knowledge, forever growing and forever seeking to become greater. He is also the sacrificer of self to self, as it tells in the Eddas. He discovered the runes by hanging nine nights on the World-Tree, pierced by his own spear; he also gave up one eye for a drink from Mimir's Well, the Well of Memory. 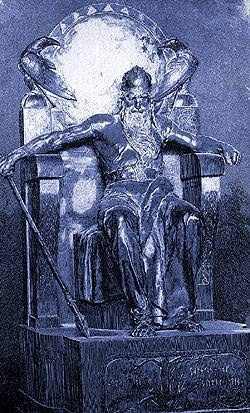 As Har ("the High One") he sits on Hlidhskjalf, from which he can see everything that happens in the Nine Worlds, but he is never content merely to watch. Odin or Wodan often travels through the worlds, cloaked in any number of disguises, in o0rder to seek out knowledge wherever it might be. Wodan the ancestor-god appears not only as the guide of the family-souls, but as the direct father of a number of clans of heroes and kings. Odin is no faithful husband to either of his wives (the goddesses Frigg and Freyja.) He fathers various clans on mortal women, his son Vidharr is the child of a giantess, while Vali is the son of a human woman whom he enchanted.